In a world increasingly defined by speed, life can get pretty intense. Fast connections, short turnaround times, urgent deadlines. A constant race against the clock. Time becomes just another commodity in limited supply. The BOSS Intensity collection puts time firmly back in the hands of those who value it most with a series of modern and masculine chronograph watches featuring a prominent bezel that enables the time to be read easily and precisely. For those whose life is not defined by the clock, LumiNova details on the hands and indexes also ensure visibility whatever the time of day or night. Crown protection, stylish subdials, and a date window combine to create a sporty, streamlined, and technical look. For the man whose life runs according to his own schedule, the BOSS Intensity range offers a selection of nine variants that each have a truly individual character, ensuring the choice of watch can be tailored to complement any look. Smooth leather straps come in a range of colors, while models with a stainless-steel bracelet convey sense of dynamism and drive. A model with gold center links in the bracelet and a matching gold bezel adds a touch of sophistication to any outfit, while an all-black ion-plated version with turquoise hands and indexes has a cutting-edge, futuristic feel. This is a timepiece that precisely captures the spirit of an elegant athleisure lifestyle. It’s time to go intense. 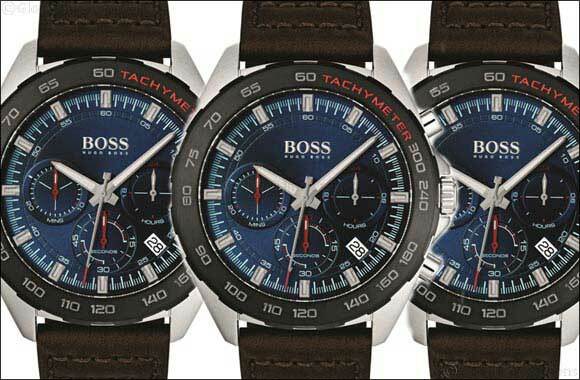 This Hugo Boss timepiece is priced at AED 1,195 and is available across Hour Choice stores in the UAE.